An innovative Model Integrated Self-financing Development Project covering a complete package of basic services for sustainable development in poor rural and urban areas has been developed. It includes hygiene education, the provision of drinking water and sanitation services, PV lighting for study, PV lighting and refrigeration in clinics, waste removal, high-efficiency stoves and bio-mass to fuel them. It provides a strong thrust for on-going local development, productivity, and employment. It contains many decentralised solar energy applications. The Model has been placed in the public domain. The Model is strongly demand response oriented. Project applications are worked out together with the users who execute, run, maintain, own and pay for the project structures. The Model provides practical working solutions for sustainable integrated development and covers all major development priorities. It constitutes a practical way of applying modern development concepts such as those outlined in the DFID "Guidance manual on water supply and sanitations programmes" (WEDC for DFID, 1998). It integrates in a practical and feasible manner policy, finance, technology and human capacity building to offer sustainable solutions to development. Project applications are self-financing, subject to an interest-free seed loan repayable in 10 years. The Model is structured for communities of 10000 households (50000 users) but can be adapted to smaller and larger project areas as required. The minimum amount of the interest-free seed loans is US$ 3.000.000 or US$ 60 per user, which covers the entire basic package of structures and services, and calls for a monthly payment of US$3 per family of 5 into a Cooperative Development Fund. The Model is structured so that some, if not all, of these monthly payments can be recovered by savings on the current expenditure of the families for the (inadequate) structures and services available to them. Project applications require 75% financing in the form of a 10 year interest-free loan by an External Support Agency. Regional or state authorities in the beneficiary countries are expected to supply the remaining 25%. 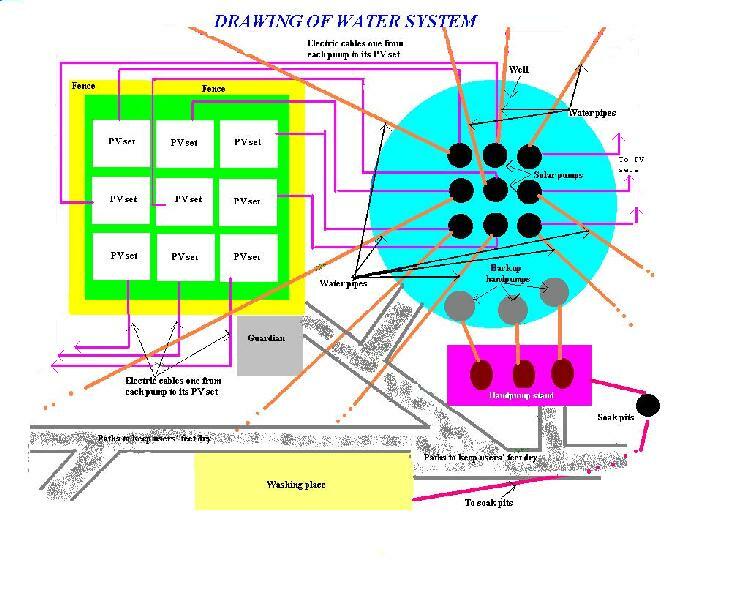 Project applications will decentralise drinking water supply. Large diameter wells and bore holes will be dug or drilled using wherever possible local labour, construction methods and materials supplied under the local LETS money systems. Schools will each receive at least one dedicated tank. Clinics, for further safety, will be served by two tanks each with its own pump. Where culturally appropriate, a communal washing area can be placed near each well so that women used to doing their washing in groups can continue to do so. The backup handpumps may also be used to service the washing areas and in cases of emergency. The drinking water supply is based on a water consumption of 25 liters per person per day. Since solar energy will normally be used to pump the water, bad weather must be taken into account. For that reason, the tanks need to have a capacity for three days' use. Each tank will supply about 200 people. Use of the solar submersible horizontal axis piston pump technology is recommended. Full details on this technology can be found through the homepage of website www.flowman.nl. The technology enables water to be pumped against heads up to 150 meters (500 feet) and more, and to be transferred over kilometers where necessary to the dedicated water tanks as well. Generalised use of solar pumps for irrigation purposes is not foreseen, as the cost of PV pumping systems, and in particular of PV panels, is still such that the application is economically unjustifiable . Where high value cash crops are to be grown using drip or seepage applications, users can apply to finance these under the interest-free micro-loans system discussed later in this paper. The Model foresees PV lighting at tank commission level, usually involving about 200 users or 40 families, for study purposes provided a suitable study room is available or has been built for the purpose by the local community. This application can be extended to community television systems for study purposes where security of the equipment can be guaranteed and where suitable programmes are available in the local language of the users. The Model foresees PV lighting for clinics. It also foresees PV lighting for schools where evening classes are needed, especially for adult education. PV refrigeration for vaccines and medicines will be installed in clinics where necessary. The Model foresees the financing of PV lighting and power systems under the interest-free micro-loans scheme where required for the purposes of productivity increase. It is a condition of the micro-loans that part of the new production or services be sold outside the project area for formal currency to enable repayment of the micro-loan. In so far as they are intended for "comfort" purposes, PV solar home systems are in principle not covered under the Model. Such investments do not lead to an increase in the production of goods and services and are therefore not directly productive. As the financial base of the individual users improves, centralised cooperative purchase by the Project of solar home systems for financing by the Local Bank under a separate micro-credit scheme is foreseen. However, where current outgo for lighting, radios and similar is such that savings in petroleum, gas, and battery costs would be enough to repay the cost of an interest-free solar home system over a period not exceeding three years, project applications will include a separate fund for the installation of solar home systems. PV powered information centres will be set up as business enterprises under the cooperative interest-free micro-loans scheme foreseen. -Cultural and economic websites ( recent experiments in India), where individual interest groups make their cultural activities and their wares known to the outside world, either independently or through the information shops. The far-reaching effects of project applications under the Model on bio-mass production and use tend to be more indirect than direct. For instance the Model does not cover small scale electricity generation from biomass, although there is no reason why this cannot be included where conisdered appropriate. Operators in India in particular tend to see this as a possible development. The qualifying feature of biomass related initiatives under the Model is that they can usually be entirely financed under the LETS local money systems, and no formal currency at all is required. This means there is in principle no limit to the number and nature of the initiatives taken. 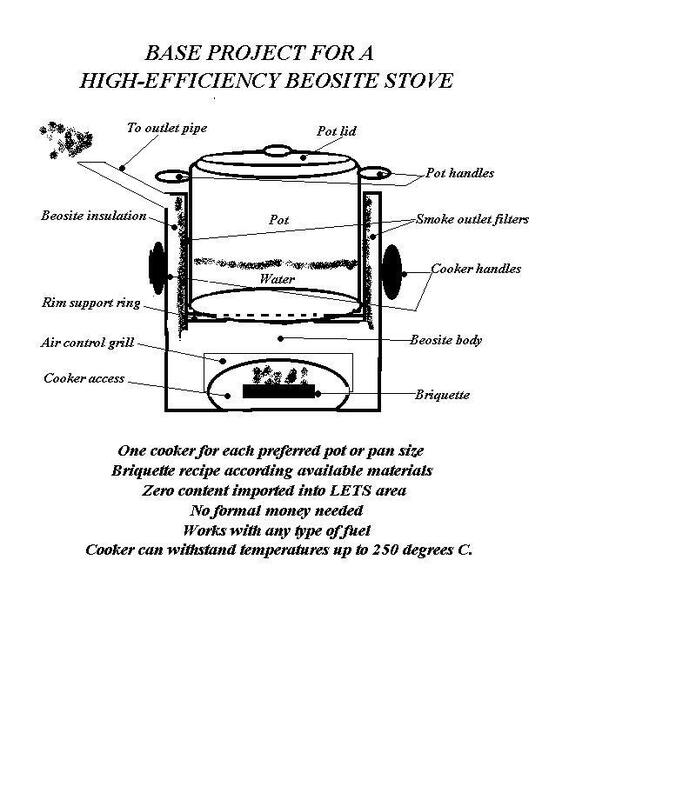 The Model foresees the introduction of high efficiency cookers built at project level from Beosite, using 100% local value added. The cookers will be fuelled by mini-briquettes made from waste materials and bio-mass using recipes varying according to the type of basic (waste) materials locally available. The mini-briquettes will be produced and sold within the local LETS systems, so that current outgo for traditional cooking fuels such as firewood, charcoal, and gas can be used for the monthly payments made by each family into the Cooperative Development Fund. In many cases, savings on cooking costs are expected to pay for the entire costs of a given project application. The bio-mass needed for the mini-briquettes will be sourced in the project area in the form of waste products or purpose grown bio-mass crops. Care will be taken to ensure that adequate natural fertilisers and soil conditioners be retained for agricultural purposes. DRAWING OF TYPICAL HIGH EFFICIENCY GYPSUM COMPOSITES STOVE. Local forests will be automatically protected once wood and charcoal are no longer required for cooking purposes. Communities in the project area will be encouraged to proceed with re-afforestation programmes to be executed under the local money LETS systems. Re-afforestation initiatives create CO2 sinks, help combat erosion, and with time create a high value resource for recreation and a sustainably run quality timber industry. The Model foresees sanitation systems involving the separation of urine and faeces and their re-cycling at household level for productive purposes. Urine appropriately mixed with water or waste water in a ratio of 1:10 can be used directly as a high quality fertiliser in home gardens, including vertical roof gardens where no other garden space is available. Assuming an average family of five the annual amount of fertiliser available is about 27.5 cubic meters. Faeces are composted separately in locally built Beosite tanks. The fully composted faeces are an excellent soil conditioner which can be used in the home garden or collected under the LETS systems. 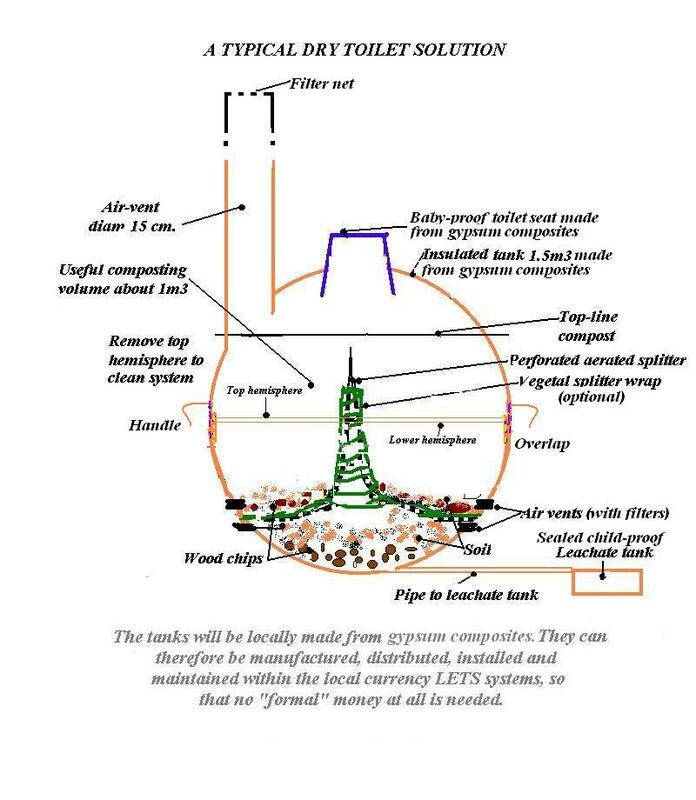 DRAWING OF GYPSUM COMPOSITES COMPOSTING TOILET TANK. 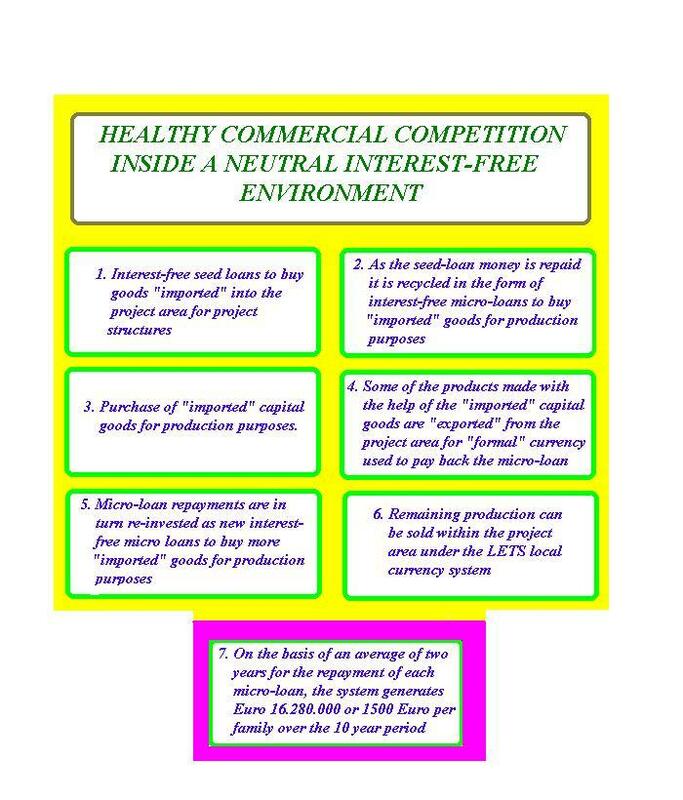 The Model therefore sets up a cooperative interest-free, inflation free economic environment and recommends the use of technologies permitting the construction of most items necessary for development in low cost labour intensive project level production units with 100% local value added. (iii)Multiple re-cycled interest-free micro-credits to be administered by a local micro-credit institution. They are generated by recycling seed loan repayments and project reserves during the loan term, and by recycling repayments of the micro-credit loans themselves. The interest-free seed loan enables capital items and services necessary for a project application but which cannot be built within the project area to be purchased. The seed loan required to cover the complete package of basic services foreseen is US$60 per user, or US$ 3.000.000 for a project application with 50.000 users. Project applications under this Model will usually be carried out in countries and areas where political stability over the long term necessary (at least the period of the ten year interest-free seed loan) for integrated development cannot be guaranteed. While capital structures installed within the framework of project applications may, if rarely, be insurable against loss or damage by Act of God such as lightning, hurricanes, or earthquakes, it is not possible to insure them against loss or damage deriving from causes such as Act of Political and Military Authorities, civil war, commotion, rebellion, and strikes. Even if insurance against such risks were to be available the cost would be so high that it would constitute a major on-going financial leakage from the project area, which is just one of the major problems applications under the Model are designed to stop. What happens in case of loss of or damage to the capital structures installed under a given project application under this Model before repayment of the interest-free seed loan after ten years must therefore be clearly addressed at the time the project application is being financed. The beneficiaries of project applications under the Model are by definition poor and the loss or damage in question derives from causes entirely beyond their control. To require these poor people to repay a loan after ten years for capital structures they have lost for reasons beyond their control is in profound contradiction with the short term and long term goals of project applications under this Model. In some cases the lending organisations may have forms of insurance available to cover funds at risk in projects in developing countries. In such cases they would ensure, at their own cost and by way of gift, that project applications under the Model are insured by such Funds. Where, however, such insurance is not available, the lending organisations should accept that in the case of loss of or damage to project structures deriving from causes beyond the power and control of the users the interest free loan be converted into a gift so that users are freed from their contractual obligations. c) Has to be repaid immediately. 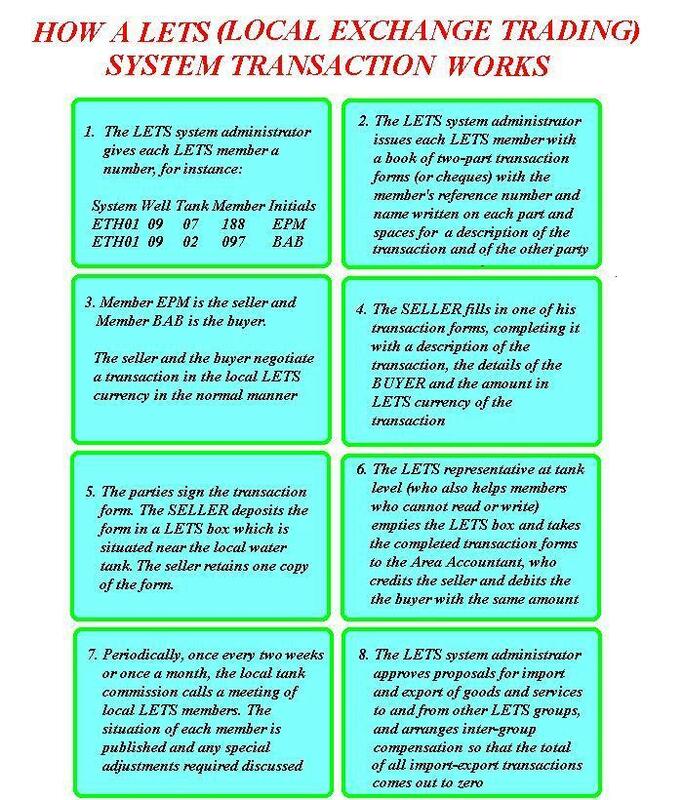 Local exchange trading (LETS) systems allow any goods and services supplied locally usuing local materials to be paid for under the local LETS currency without the need for any formal currency at all. 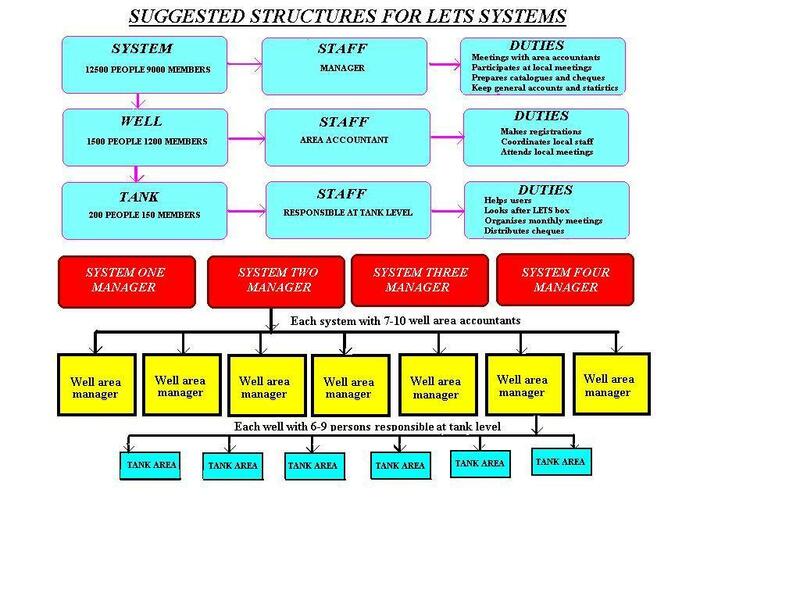 The Model is therefore based on technologies, and in particular the Beosite technology, which allows most items needed for basic services in the project area to be built or carried out within the LETS systems with 100% local value added. LETS systems are operating world wide. However, the concept of incorporating their use as a fundamental element of integrated self-financing development projects is thought to be new to the Model presented. Fig. 4 shows a typical LETS structure. Multiple re-cycled interest-free micro-credits provide formal money needed to develop local production capacity. The rest of the development under project applications is carried out under local exchange trading (LETS) systems set up in each project area. Micro-credit systems within the framework of project applications under the Model will be set up by local micro-credit institutions. Final repayments of blocks of micro-credits will be co-ordinated so that money for long term capital investment purposes (system replacement and extensions) will be available when it is needed. An example of this is shown in columns 37, 38, 39 and 40 of the chart in fig 7, where the higher columns indicate shorter payback times for the last lots of micro-loans so that the entire interest-free seed loan capital of US$ 3.000.000 is available for payment in the 41st quarter. 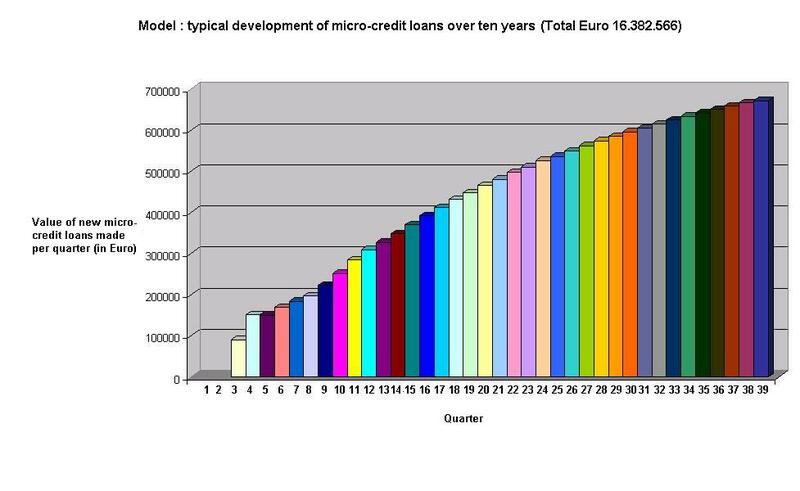 The following chart (which has been drafted in Euros) shows a typical build-up of micro-loan investment over the first period of ten years of a project application. It shows the amount of new micro-loans actually (re)invested each quarter during the first period of ten years. The amounts are net of current outgo for project administration and maintenance of structures, which have already been deducted. In the chart, the original interest-free seed loan is paid back in the 41st quarter. The capital available for micro-loans temporarily falls back to the amount actually being paid into the Cooperative Development Fund each month by the users. It will then gradually build up again over the next period of ten years, so that a further amount of at least US$ 1500 can be made available (on an average) to each family in the form of interest-free micro-loans. This time the funds accumulated belong to the users themselves, and are available for renewal and/or extension of project structures when needed. The possibility of sale of some of the production to consumers from outside a project area for formal currency will usually be a condition precedent for the granting of a micro-credit loan. This condition of partial "export" sale lapses as soon as the micro-loans have been repaid. In project applications where an export-import cooperative has been set up, the cooperative may often be able to help the beneficiary of a micro-loan export part of his or her production in exchange for formal currency. The rate at which micro-loans in formal currency can reasonably be recovered will determine the payback period, which could therefore be anything between a few months and a few years. The rate of the loan repayments must be realistically possible for the borrowers. The system is co-operative and interest free and designed to enhance the general welfare within the beneficiary communities. As with the Grameen bank systems, any person or co-operative group wanting a Micro-Loan will be expected to produce four friends who agree to be jointly and severally liable for the periodic loan repayments, and to make sure they are made on time. Since the Micro-credits are essentially self-financed by the communities through their Cooperative Development Funds, the funding priorities must be left to the communities themselves. This is especially so where potential conflicts of interest arise because there is not enough funding immediately available to meet all requests for assistance. Meetings to discuss members' proposals and further developments with on-going projects will become a feature of the social life of the communities at tank commission level. Since it is expected that many of the beneficiaries under the scheme will be women and women's groups, women will need to have full representation during such meetings. One of the basic goals of the formation of the Community Health Clubs foreseen in the Model Self-financing Integrated Development Project is to use the Health Clubs as a launching pad to create women's groups. These groups will give women the chance to discuss their needs, develop their priorities, and make submissions during the Micro-Credit meetings. The Health Clubs should also be able to ensure that women participate en bloc at the Micro-Credit meetings.